A sequel to the movie Red, which was about a group of retired CIA agents forced back into action. 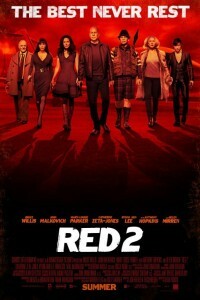 Red 2 was filmed in Moscow, Russia. Sadly, Ernest Borgnine died at the age of 95, in July 2012, before filming of Red 2 commenced. Originally scheduled for release on August 2, Summit pushed up the release date of Red 2 to the more lucrative July 19, 2013 date.